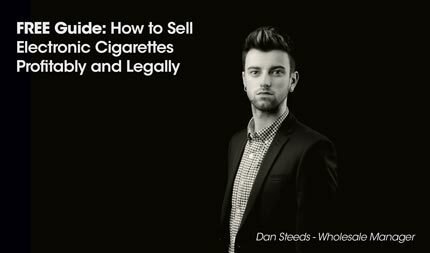 Dan Steeds is the wholesale manager at ECigaretteDirect.co.uk, and has helped dozens of sellers get started selling ecigarettes and eliquid. In this blog post, with the help of our retail manager who runs our chain of shops, he shares some of the lessons he has learned. If all the smokers in Britain stopped smoking cigarettes and started smoking e- cigarettes we would save 5 million deaths in people who are alive today. It’s a massive potential public health prize. Do you want to be a part of the massive potential public health prize the Electronic Cigarette Industry has to offer? Whether you’ve arrived by mistake or hours of research have brought you to this point, here you can find the essential information you will need to know before venturing into the world of selling the ecigarettes. Electronic cigarettes are continuing to grow, and are proving a lifeline for shops that need to find a new line of revenue, as well as for shops that specialise in selling electronic cigarettes. Even more importantly, you will be helping your customers in a huge way. Ecigarettes have helped millions to find an alternative to cigarettes, scientists believe they could be as much as 99% safer than regular cigarettes, and they have also helped people save money (around £1800 a year for a 20 a day smoker). The tips that follow are here to help save time and a lot of money – not to mention the legal costs. Visiting China: From factory visits to avoiding prostitutes! First, and probably most importantly are the rules and regulations that run alongside the industry. Compliance with these is essential, as Trading Standards can and will strip non compliant products clean off your shelves. Unfortunately, this is not always easy as Trading Standards seem confused as to the requirements themselves and enforcement of standards is not always applied evenly. Pharmacologist Gwyn Taylor tests eliquid in the Smoker’s Angel lab. With former international testing company SGS no longer performing tests on eliquid, the best place to get eliquid tested is in the UK. 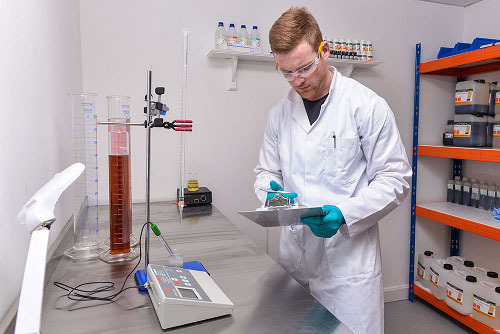 UK government approved labs will help you test for nicotine accuracy and contaminants. In the future, emissions testing is also likely to be required, and ECITA is planning to make this mandatory for all members. ROHS (The Restriction of the Use of Certain Hazardous Substances in Electrical and Electronic Equipment) is required for electrical goods. Again, if you are importing we recommend having all electrical equipment tested in UK government approved laboratories. weee compliance means ensuring that your batteries are recyclable, and that every battery contains the weee symbol. 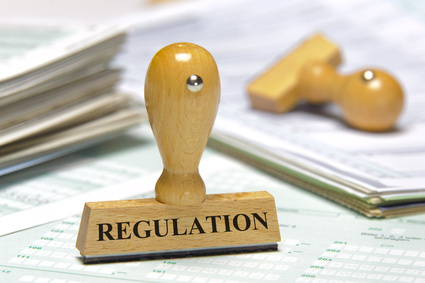 Unfortunately, we can’t cover all regulations in this blog post. If you need more advice, feel free to contact me on [email protected], or give me a bell on 01792 391708. With so many different suppliers out there in so many regions of the world, finding a reliable source can be very tricky. When approaching your potential supplier, you will need to know plenty of information to avoid certain pitfalls. Testing independently carried out in UK (or your home country) on product and ongoing testing for e-liquid. Check with your supplier to make sure they are testing for impurities as well as nicotine strength. (In the UK) UK CE approval or company’s own CE certification. This indicates the products compliance with EU legislation. Delivery time: You need to make sure your supplier can keep up with your demands and get the goods to you within a reasonable time frame. ECITA membership (UK only) – Not essential, though this is always the best indication of compliance. Fake Certification: Some companies just insert their own name on the required CE and ROHS certificates! Fake Sellers: Your Chinese “manufacturer” may well be a reseller without the ability or desire to rectify problems or deliver orders as placed. Poor Quality Stock: There is a lot of very poor quality product for sale, often purporting to be genuine named brand items. If it is very cheap that is a good indicator! You get what you pay for with electronic cigarettes. Although it might be hard when you start off, paying for quality will help you build up a long term customer base. Deteoriating Quality: Some suppliers will send you good quality stock to start with, but then you’ll notice the quality level starts to fall. This can be due to cost cutting, although sometimes Chinese factories have problems with own their sub-suppliers. Usually, the only remedy is to switch to a new supplier. Great samples, poor product: You may also find that certain suppliers provide great samples, but then follow up with a large quantity of poor quality stock. Incorrect and non compliant labelling: The UK regulations for CLP and CHIP compliance are very strict. If not found to be correct Trading Standards will seize your goods. Build relationships with other UK ecigarette companies. We have great relations with several other ecigarette companies, and share our experiences with different suppliers. This helps us all avoid issues with bad suppliers. Who should buy from China? Battery quality control in a Chinese factory. Buying from China is suitable for large companies, with the resources to visit China and to carry out compliance and testing here in the UK. It’s a good idea to join ECITA, as they will ensure the products you buy are fully compliant. Smaller companies, individual shops and one man bands will be better off joining up with a reputable UK company. One alternative, possibly more for the smaller retailers is to buy from an IBVTA member, such as ECigaretteDirect. The IBVTA carefully audits companies before accepting members and assists members ensure they are fully compliant. They even have a trading standards group assigned to them, which ensures any trading standards issues with products are dealt by a body which has a good understanding of the rules. That’s not to say you should automatically exclude a good company. However, an IBVTA logo is a pos. When you do visit China, be aware that companies WILL try and tie you up with lengthy meetings to ensure that you have a little time as possible to meet competing companies. Be strict with your schedule! If you visit a factory which seems very understaffed and the staff are working slowly, you could be visiting a ‘fake factory’, one which has been set up purely to impress visitors. Obviously, if they are going to such lengths to avoid showing you their real factory (should they actually have one! ), it’s not a good sign! I can produce e-cigarettes for any price you want. But they’ll be crap. You can get e-cigarettes very cheaply, but you won’t get quality. You may be able to make one off sales, but you will sacrificing the long term relationship with your customer. Also be aware that social evenings with your Chinese hosts may be a little different from ours. Our MD was particularly shocked when taken to a Karaoke bar with several other business people, and a Mama San lead in a line of prostitutes. Finally, don’t forget to take toilet paper with you! These are not generally supplied in factory toilets. We also take antibacterial hand wipes. 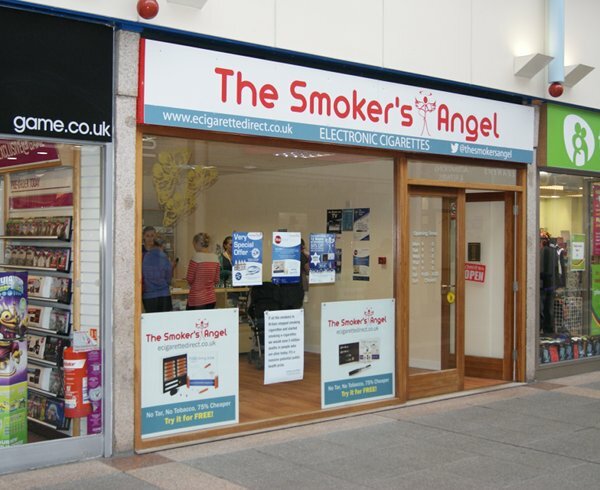 The Smoker’s Angel in Bridgend. Your shop/stalls first impressions are a crucial part of the business – it is human nature to judge a book by it’s cover. If your customers are walking into a shop that is well presented, with well laid out products and eye catching advertisement they are more inclined to be thinking positively, rather than walking into a dimly lit shop with no care for the product. There are a lot of different Electronic Cigarette retail outlets around at present, you’ll need to be sure your potential property is not in the firing line of a larger, more established retailer. So do some footwork and scan your surroundings. A bit of small competition can be good for your business as it raises awareness of the product, so don’t knock it straight away – you always have the option to do things a bit differently and stand out from the crowd. It’s also worth buying some products from your potential competitors. Check to make sure they’re compliant (if they’re not, your competitor probably won’t be there for long) and that the taste of the eliquid/cartomisers is good. Finally, always scan the area to get an idea of what the footfall is. Shopping areas will often provide the footfall. Also look for people smoking – some affluent areas have low levels of smokers and would not be suitable for an electronic cigarette shop. You don’t need a large shop: we find that 300 square feet is perfect, ideally with a 15 foot frontage. Obviously, you won’t always get the exact size you want, but try to avoid paying for size you don’t need. However, you don’t want to be sitting on mountains of stock that you aren’t going to shift for months. Here at The Smoker’s Angel we have a variety of “Starter Packs” available to help you out! There’s a balance to be had here. On the one hand, you don’t want to be kicked out after a year, when you have spent money establishing your shop and building up a customer base. At the same time, you don’t want to be tied in for five years, when we are still unsure what 2016 EU regulations will come in. We recommend looking for a get out clause after a 6 month period. You will need a solicitor to review your lease to make sure it is suitable for you and that it corresponds to the terms you agreed with the landlord, to carry out searches and make enquiries (e.g. to make sure that the person you are paying rent to is actually the owner) and deal with any registration requirements. Some insurance companies may offer the three of these together as a package, but be aware that this will not always be the cheapest option. If you are a limited company, you may also want to look into director’s liability insurance. Product liability insurance: Ideally, if you are buying from a UK supplier, you will already be covered by their product liability insurance. Do check with your supplier, as not all suppliers are covered. If you are importing from China you will need to organise your own product liability insurance. 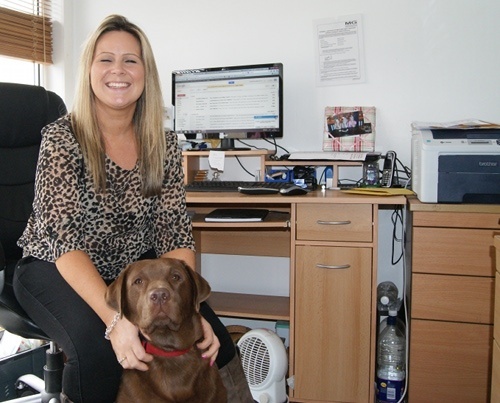 Jo, our customer services manager, and author of our customer service bible, at work with her dog. As a reseller, your main priority will be your customers and will you want to provide them with a service that makes them feel as important as they are. Good customer service can go a lot further than you realise. Be the fully informed expert your customers need, taking time to establish and fill their requirements. Most of the following points have been partially drawn from our own customer service Bible. We’ve often been told by customers that we’ve provided the best customer service they have ever had, so these points are worth bearing in mind! This may be a given, but it’s worth saying anyway. Responses should always be empathetic and professional. Even if you feel your customer is being demanding or unreasonable, offer polite, rational responses and maintain the good image of your company. However, you must know where to draw the line, you do not want to come across as patronising. We feel it is very important to use people’s names, so use them if you know them! If not, it doesn’t hurt to ask, but always ask how they would like to be addressed as you do not want to cause offense. People like to be remembered, this adds a personal level to your encounter without too much effort on your part. Even something as simple as “Hi *name*, How are you?”, you could add a touch of humour to it “Oh no, not you again, here comes trouble!” – assuming you are on good terms with the customer, of course! The first step in dealing with complaints is acknowledging the issue, show interest and acceptance of the fact that they have a problem. Even if you can’t resolve the issue, you want them to know that you want them to have the best possible experience with your company. Even if you can’t help to solve a customer’s problem, let customers know that you are listening and working on solving their issues. Be honest, even if it makes you look bad, your customer would prefer a truthful answer to being given false hope. Sometimes you can provide exceptional service by doing a little something extra for your customer, such as providing a free bottle of ejuice for a regular customer. Over and over again, we have seen that dealing with an error in the right manner turns an unhappy customer into a long standing one. Always be prepared to give a little away. 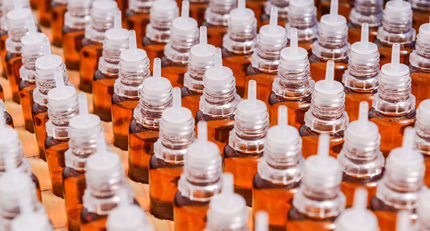 A bottle of your E-liquid is considerably cheaper than losing a customer for good. Giveaways are always a selling point, if you have a customer who isn’t sure on a purchase offer, consider throwing in a little something extra at no extra cost, this should help them make their mind up. Smokers can buy ecigs online or from large stores. But what they can’t get from this place is expert, friendly and supportive advice. And it’s just as important to provide this as an after sales service as well as at the time of purchase. Staff at The Smoker’s Angel in Llanelli, South Wales. To achieve all of the above, you’ll need a strong staff training program. We start by bringing new staff into our warehouse. In addition to packing and getting to know the products, they are given tutorials in electronic cigarettes – how to fill them, how to use them and how to troubleshoot issues. They are also provided with training documents and our customer service Bible. To reinforce the importance of these documents, staff have to sign each section to show they have read and understood them. The staff are then sent to one of our shops where they will work side by side with an experienced sales assistant until we feel they are ready to go alone! We continue to monitor their dedication to customers by using secret shoppers, with feedback provided to each member of staff after the secret shopper’s visit. We believe that you can’t expect a lot of staff if you don’t treat staff well. Pay Well: All our staff are paid at above Living Wage. Give Bonuses: There’s nothing more likely to improve staff performance that performance related bonuses! It also means that when shops do well, staff share in the success of the company – something we believe is very important! Show Appreciation: While pay and bonuses are important, we also believe it is important to acknowledge and praise staff when they do well. But could also take the form of taking a team out for a drink or sending some flowers. The rewards for you are huge. In fact, we’ve found that many of the ideas that have driven our company forward have come from our fantastic team. A bit of humour never goes astray! Generally, in our experience, advertising in magazines is a waste of time and money. The best marketing, in our opinion, is providing good customer service. However, it is also worth contacting local media and letting them know about your shops and any events you hold. This is always a hit and miss operation – sometimes you will end up with a good article in the local paper, sometimes you will get nothing! We also recommend getting out on the street with leaflets when you first open the shop – make sure there is a good opening offer and a map showing the location of your street. 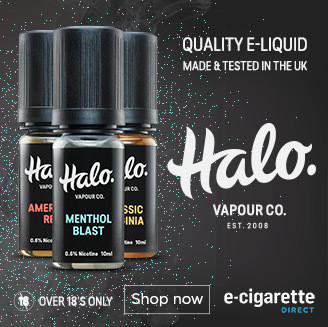 In the shops you will need point of sale material to highlight the benefits of ecigarettes (at least, those we are allowed to advertise) as well as any special offer. This is a tricky subject, and the wrong information can do damage to your business and the industry’s reputation. In the UK and in the USA we CAN NOT make any claims that electronic cigarettes can help you stop smoking. However, you can say that electronic cigarettes give smokers the option of switching from one form of nicotine delivery to another. If you are looking to set up your outlet in another country, you’ll need to check with your equivalent of trading standards about which claims you can make. Finally, good luck! If you need any further advice, don’t hesitate to contact me on [email protected] Alternatively, for more information, free downloadable guides and our product catalogue visit our e-cig wholesale page. We’re thinking of expanding this blog post into an ebook. If this would interest you, please let me know in the comments! I am an E-cigarette supplier from China, actually, I agree most of what you say. I also strong recommend that you come to China for visiting, not only can you know whether it is fake, but also it will bring lots of befefits in the following cooporation. For the prostitute, I don’t totally agree, I can estimate the rate should be about 10%, at least I never lead my customer to this kind of place. For the factory visiting, I think if you go to see the QA and QC process and tracebility report is better, that will help you to see the quality history. Also if the enterprise passes ISO9001 will also need to be considered for priority. At last, I want to say, you’d better get some samples at first, test in UK to see if the quality is within your requirement, because it is difficult to comply the quality and safety standards among all the countries. I am willing to share more with you, and you could conact me through email. Hi both, I’m actually looking into the number of e-cigarette’s sold around 2006-2007. I know there wasn’t many around and believe Ruyan was a market leader back then in China. Do you know whether you have this information or where I can obtain it? Any direction would be very useful! I don’t, I am afraid. When we started back in 2008 there were very few sold and hardly anyone knew about them. Interesting points that you raise, I agree that a handful of negative experiences do not reflect honestly on a countries trading practices. I’m just starting out in the world of E-Cig sales as a sole trader. I’ve had very good co-operation in my dealings with reputable Chinese manufacturers. Obviously there are always going to be many risks and pitfalls in any business ventures and I suppose importing from other countries does seem to amplify the idea of risk, especially with so many horror stories surrounding potential outcomes. Im having great difficulty here in Ireland sourcing product liability insurance for a new online vape shop we will be launching next month. Is there any chance e you would have any advice of getting this, or know of an insurance company in the UK that covers the republic or Ireland also. Hi Robert, have you joined a vape trade organisation? These usually provide great advice on insurance (and other matters) and sometimes negotiate special deals for members. Vapers, who should you vote for in the EU elections?